When Amanda Steele started her beauty YouTube channel in 2010, the title of "YouTube star" didn't even exist. Then, 10-year-old Steele was simply interested in finding an "outlet to talk about things [she] was passionate about." 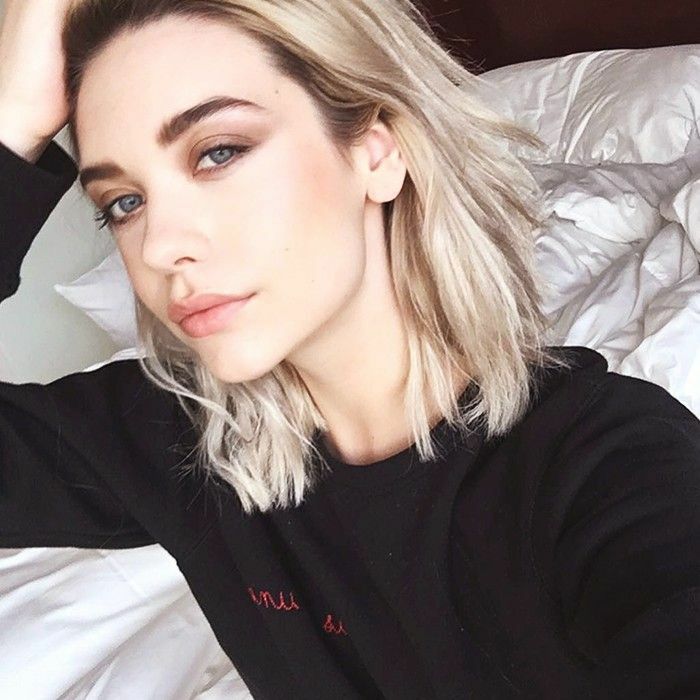 Using the handle MakeupbyMandy24, Steele posted casual makeup and hair tutorials, product hauls, and favorites videos, her future career as a digital celebrity, actress, and model not even a twinkle in the pre-teen's eye. Six years later, Steele has become one of the most followed influencers in the beauty and fashion space. (She has 2.9 million subscribers on YouTube and over 2.7 million Instagram followers—find her stylish low-fi shots @amandasteele). She's gone on to collaborate with big-hitter brands like Bobbi Brown, CoverGirl, BH Cosmetics, L'Oréal, and Maybelline. She's also signed with WME and IMG Models and starred in the scripted web series Guidance. But somehow, even as her success skyrockets, the 16-year-old beauty lover seems to strike this rare balance between someone you look up to and someone you'd want to be your best friend. We witnessed this unique quality firsthand, when Steele popped by the Byrdie HQ for a five-product drugstore makeup tutorial, which you can watch now on Byrdie's Facebook Live. BYRDIE: How old were you when you first started falling in love with makeup? What inspired you then? AMANDA STEELE: From before I can even remember, I always had so much makeup, I would always play with it, [and] I loved dress-up. At like six years old, I would be playing with makeup. I remember it was like a joke that I had way more makeup than my mom. And my sister never was really into it, my mom wasn’t really into it; it was just kind of me. And I took my love of just being a girly girl, you know like as a little kid, into finding it online and watching YouTube videos and seeing that other people were passionate about it and talking about it. So that’s really how it happened. BYRDIE: When you first started on YouTube, did you have any dreams for your channel? Did you ever expect it to get as big as it has? AS: Not at all, especially because now if someone starts on YouTube they know what they can get from it. But when I started there wasn’t a thing called “being a YouTuber.” It just wasn’t a thing; it was just people that liked making videos or liked talking about their favorite makeup products online. It was just a community, really small, so I never expected anything. All that I wanted from it was an outlet for me to talk about things I was passionate about and connect with other people who shared that same kind of passion. Because there was no one else I could talk to about that kind of thing. AS: Yeah, there was. Like my first brand deal that I did. That’s when I was like, “Whoa what’s going on?” And my mom was like “Whoa what’s going on? !” And then after that, I signed with a YouTube network, which I didn’t even know existed. I was like “What?” I went to the office, where all of these people have this desk job that’s revolved around my hobby. It was the weirdest thing for me. And they sat me down and showed me all the things, like the deep down computer stuff that I didn’t ever realize. Then I was like, Wow this is for real. There were all of these people behind me, like supporting this and believing in me. So that was when I realized. BYRDIE: You have gone through so many drastic beauty changes since then, and millions of people witness them online. How do you handle evolving before so many people? Are there ever moments when you look back to one of your past beauty looks and cringe? AS: Yes. Always. I look back and I’m like that was bad. I always think I’m “glowing up” more, but it’s fun to look back see the things that I did. Like when I dyed my hair platinum. That inspired a lot of people to do that too. So it might not be the coolest thing now to have my white, dead hair. But at some point it was. BYRDIE: Oh, I remember that. It was so cool. We were all like, this girl has arrived. AS: Yes, so basically I look back on it as like, that was who I was then, and that’s what I liked then, it was cool then. I don’t want to be too hard on myself because it was still inspiring to a lot of other girls. BYRDIE: Oh, for sure, that’s the best way to look at it. What are a few of your makeup obsessions right now? AS: The Make Up For Ever HD Foundation sticks ($43). The sticks. Oh my gosh! I have not found a single foundation as good as that. It gives you like a new layer of skin, and it stays on forever. Like it’s seriously the best. It’s my favorite. BYRDIE: Any looks or techniques that you’ve been experimenting with lately? AS: I used to do a lot of makeup, which I still do because I like makeup and I like playing around with it, but I would do my eye shadow, dark brows, lashes, eyeliner, just kind of everything. Now I’ve just been using the same number of products and still having fun playing around with things, but now I do it to give off a no-makeup makeup look. So I am wearing foundation, full-coverage foundation, and highlight, concealer, bronzer, all of that. But I just am now doing a technique where it looks super glowy and natural. BYRDIE: Totally, I relate to that. Are there any makeup trends happening right now that you aren’t down for? AS: I’m kind of open to everything because that’s what I do; it’s trying them out and seeing what I like about them and stuff. I just think that the full, bright white concealer, and the dark contour, like with liquids, that stuff is just not necessary to me. It’s fun to play around with every once in a while, but when I see people who have like super-bright concealer and then super-dark contour, it looks too intense and too much for me. I think if they just kept it more natural, it would look a lot softer. BYRDIE: Are there any celebrities or other YouTubers that you look to for inspiration? AS: I definitely like to look at a lot of models. I mean obviously they’re models, you look at them and they’re gorgeous. But also they do their makeup in a way that they will never cover up their actual face. It’s focusing on your features and embracing the features naturally on your face, not trying to make an illusion of different features. I recently have been seeing how models are super natural and glowy and not over the top with their look. Simple and pretty. BYRDIE: Anyone in particular that you think always looks fly? AS: I think Gigi Hadid, just because she does a lot of fun looks too, like she will do dramatic looks, but she still glows out of it. Basically, she’s always still her. BYRDIE: What are a few secret tricks that you always rely on when doing your makeup? AS: One thing that makes it a lot easier to do winged liner is if you do your mascara and your lashes first, because it gives an outline of how you’ll want to draw it out. I don’t know why, but if I put fake eyelashes on first and then do my eyeliner on it will look so much better. BYRDIE: That’s such a good tip! So you obviously have the most amazing Instagram. What makeup looks do you think look the best on Instagram? Any tips for always looking cute on IG? AS: I’ve mostly been posting outfit pictures on Instagram, that’s what I’m focused on right now. But definitely when I do my face all snatched, going full out—lashes, dark lip, colored eye liner, things like that—those always do so well on Instagram. Your take the selfie and they’re like “whoa!” just because the makeup looks so good and it’s all in-your-face too. I did this look and it was kind of deeper colors, and my eyeliner matched the lipstick. It was from Colourpop. So there’s was that one, and I was looking back at it yesterday, and I was like, Wow people loved this I should probably do a tutorial. BYRDIE: A lot of YouTubers go on to develop makeup lines and other ventures. Do you have any future plans or dreams for what’s next? AS: Yes, I am the kind of person that wants to try everything. I am so lucky to have amazing teams behind me, and what I have right now gives me the opportunity to do basically whatever I decide to put my mind to. Clothing line—that kind of thing is what I first would want to do. Also makeup, that’s always been something that I would love. I did do a makeup palette before for BH cosmetics, so I kind of did that a little bit. My brain could explode thinking about all the things I want to do. Don't forget to catch Steele's five-product drugstore makeup routine on our Facebook Live!